1727: he starts his career at the Moritaza as an iroko, disciple of Tamazawa Rin'ya. 11th lunar month of 1734: Saijirô becomes wakaonnagata and plays at the Nakamuraza in the kaomise drama "Kyôganoko Secchû no Tamatori", which celebrates the arrival in Edo of the Kamigata actor Nakamura Shingorô I. 11th lunar month of 1737: Saijirô plays at the Ichimuraza the role of Takakura-no-Miya in the kaomise program "Genji Kumo Ôgi no Shiba", which celebrates the shûmei of Ichimura Uzaemon VIII; the others stage partners are Sawamura Sôjûrô I, Bandô Hikosaburô I, Kamakura Chôkurô II, Tomizawa Montarô I, Matsumoto Kôshirô II and Tsuruya Nanboku II. 1st lunar month of 1738: Saijirô plays in the same theater the role of the courtesan Ôiso no Tora in the new year sogamono "Ukematsuri Manbai Soga"; his stage partner in the role of Soga Jûrô Sukenari (Tora's lover) is Sawamura Sôjûrô I. According to the chronicles, the performance is not a success. 11th lunar month of 1738: Saijirô plays at the Ichimuraza the role of Kôtô-no-Naishi in the kaomise drama "Mitsugibune Taiheiki". 11th lunar month of 1740: Saijirô plays moves to the Nakamuraza and plays the role of Sagami Nyûdô's daughter in the kaomise drama "Miya Bashira Taiheiki", which celebrates the shûmei of Ichikawa Danzô III and Tomizawa Tatsujûrô. 1st lunar month of 1741: Saijirô plays in the same theater the role of the courtesan Ôiso no Tora in the new year sogamono "Na no Hana Akebono no Soga"; his stage partners in the roles of Soga Gorô Tokimune, Soga Jûrô Sukenari (Tora's lover), Kudô Saemon Suketsune and the courtesan Kewaizaka no Shôshô (Gorô's lover) are Ichikawa Ebizô II, Nakamura Shichisaburô II, Ichikawa Sôzaburô I and Arashi Tominosuke I. 11th lunar month of 1742: Saijirô plays at the Ichimuraza in the kaomise drama "Furisode Shinoda no Zuma", which welcomes in Edo the Kamigata actor Onoe Kikugorô I; his stage partners are Bandô Hikosaburô I, Segawa Kikunojô I, Ichimura Uzaemon VIII, Bandô Matatarô III, Nakajima Mihoemon I, Tomizawa Tatsujûrô, Ichikawa Sôzaburô I, Sanogawa Senzô, Ichikawa Raizô I, Sawamura Utagiku and Ichimura Manzô. 1st lunar month of 1744: Saijirô's rank in the Edo hyôbanki, wakaonnagata section, is jô-jô-(shiro)kichi (superior - superior - (white) excellent). 5th lunar month of 1747: the play "Sugawara Denju Tenarai Kagami" is produced at the Nakamuraza for the first time; Saijirô plays the role of Haru [casting]. 4th lunar month of 1750: the play "Sugawara Denju Tenarai Kagami" is produced at the Moritaza for the first time; Saijirô plays the role of Haru and Tonami [casting]. 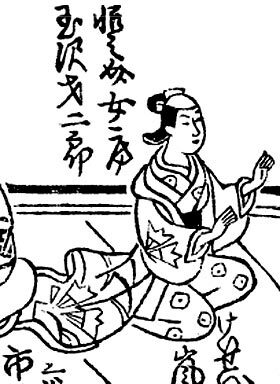 1st lunar month of 1751: last recorded performance of Saijirô, who plays at the Moritaza the role of the courtesan Ôiso no Tora in the new year drama "Suketsune Ôgi Keizu". Tamazawa Saijirô I was an onnagata actor, who made all his career in Edo during the first half of the 18th century. He excelled in the role of the courtesan Ôiso no Tora (sogamono). He was very handsome and was popular among the female audience. One hyôbanki writer wrote in 1742: "For this person, I could cut my finger or die".